Unleash the god from the machine! The Deus ex machina is an activatable artifact that can affect a hero in a good or bad way. "Deus ex machina" is Latin for "god from the machine." In literature, it is a plot device to solve an impossible problem with an unexpected event. Writers generally frown upon the use of a Deus ex machina and readers have been known to riot upon witnessing one. A Deus ex machina in Godville is a small box of highly technological design. It is three times the size of a hero's fist and weighs about three pounds. Manufactured by the Machina Corporation in the town of Tradeburg, the items are sold or given to monsters on a daily basis. While the production process is a heavily guarded secret, it is believed that the contents are not placed into the boxes until after they have been fully assembled. Others believe that a specially assigned God inserts the items mere moments before activation so that each box’s content is specific to the hero. 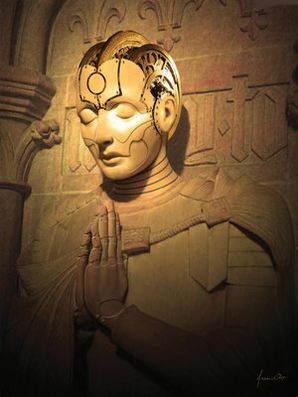 Merchants commonly purchase a Deus ex machina for approximately 1000-2000 gold coins. Like in bad literature, a Deus ex machina in Godville can affect a hero in a random or ridiculous way. It is the ultimate lottery in the Godville universe. Activating the Deus ex machina will instantly instill the hero with the desire or urge to open, examine, disassemble, shake, rub, or take apart the item. If the hero successfully opens the item, he may find gold coins, one or more golden bricks, a notarized death certificate, a notarized document, a note, a spiteful gremlin, a scroll, or nothing at all. Opening the item and finding nothing though is an arduous task and a hero usually gains experience points in the process. If the hero shakes or rubs the Deus ex machina and nothing happens, he will become annoyed and will try to break it with a golden brick. Since Deus ex machinas are very strong, smashing it with a golden brick just damages the golden brick. 07:22 Felt a burning desire to open the Deus ex machina. Found inside something unbelievable — a scroll with instructions on how to get a premature level up! There are many possible outcomes of activating a Deus ex machina[BB 1]. Nothing happening. If your hero has not completed their temple, the annoyed hero tries to break the Deus ex machina with a golden brick resulting in the loss of the item and the golden brick. If the temple is complete, nothing happens but the loss of the artifact and expenditure of godpower. Overall, positive effects are much more likely than negative effects. ↑ Godville forum, "Black box reward chances"
This page was last edited on 4 April 2019, at 15:01.